At first blush, a court of appeals case which is not recommended for publication, but may be cited, presents the common and troublesome issue of a child making choices. Upon closer reading, however, the case is much simpler. 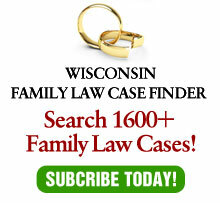 In Dohm v. Dohm, 2011AP116, the court of appeals affirmed a trial court order modifying placement so that a 13 year old girl would live primarily with her father, which was consistent with her wishes. The girl had been living primarily with her mother during the school year and (it appears) equally with her parents during the summer. But, at the time of the divorce, the parties lived across the street from each other. Then, the mother moved approximately 50 miles from the father. The mother’s appeal raised a number of issues which were easily dismissed by the appellate court as not being developed, including the court’s alleged bias due to her religion and sexual orientation. Her main argument, however, is that the court relied too much on the wishes of the child. The question of a child’s wishes about placement is a difficult and sensitive one, which I may explore in a future blog. This is not the proper case for it because the appellate court found that the child’s wishes was only one factor which the court considered to determine best interests. The court upheld the finding that moving from across the street to 50 miles away constituted a substantial change in circumstances. (Duh!). Also, the court considered the testimony of Dr. Kip Zirkel who was retained jointly by the parties (without specifying what he recommended) and that the girl was doing well academically and with numerous extracurricular activities. In short, Mom moved, Dad was perfectly available to maintain schooling and other activities and the child wanted to stay with Dad. One wonders why this is even a signed opinion. The issue of a child’s choice is still worth a mention. Wisconsin does not have a “magic age” where a child make choices. Interestingly, in my experience as a GAL, most children do not want to choose between parents. When a child does wish to state a preference, the evidentiary methodology is not always easy as children should not be brought to court (unlike some other states). Also, the conflict between a child choosing a parent vs. the best interests of a child is not always a clear one. Further consideration of this difficult issue, it appears, will have wait.